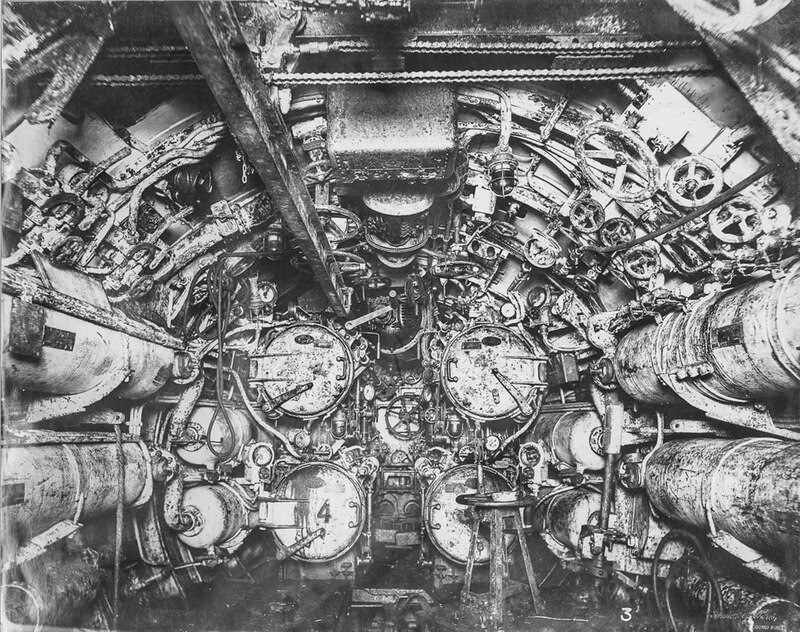 The four torpedo tubes of UB 110. 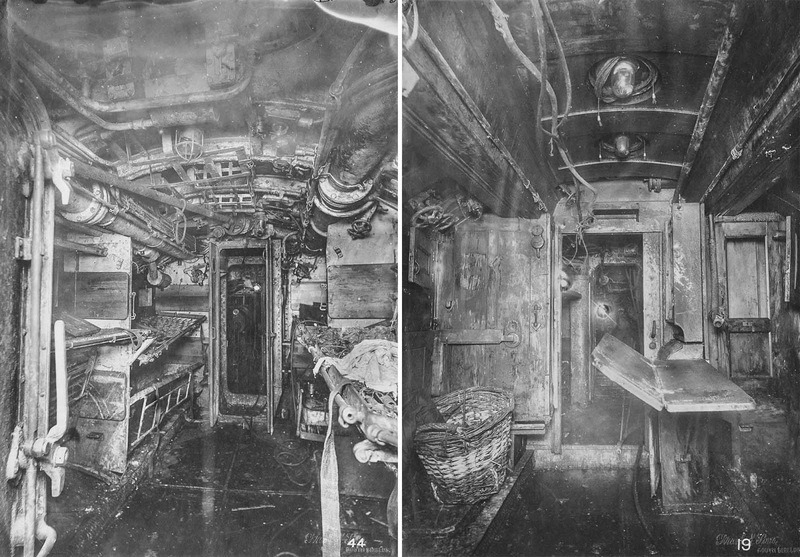 These photographs show the UB 110, a German submarine that was sunk and risen in 1918. 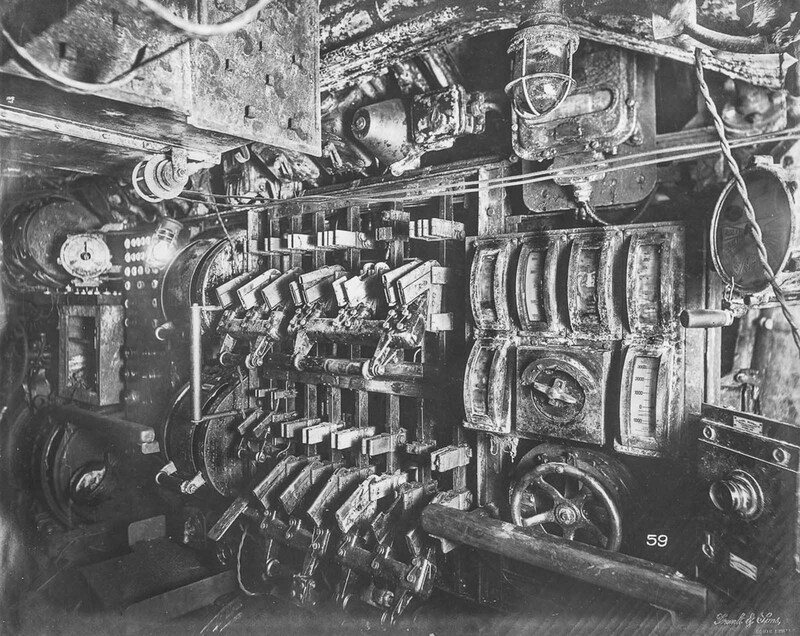 The show the control room in the submarine, including the manhole to the periscope well, hand wheels for pressure gear, valve wheels for flooding and blowing and the air pressure gauges. SM UB-110 was built by Blohm & Voss of Hamburg. After just under a year of construction, she was launched at Hamburg on 1 September 1917 and commissioned in the spring of 1918 under the command of Kptlt. Werner Fürbringer. Like all Type UB III submarines, UB-110 carried ten torpedoes and was armed with an 8.8 cm (3.46 in) deck gun. UB-110 would carry a crew of three officers and up to 31 men, and had a cruising range of 7,420 nautical miles (13,740 km; 8,540 mi). Her engines enabled her to travel at 13.3 knots (24.6 km/h; 15.3 mph) when surfaced and 7.4 knots (13.7 km/h; 8.5 mph) when submerged. On 19 July 1918, while under the command of Kapitänleutnant Werner Fürbringer, SM UB-110 was depth charged, rammed, and sunk near the Tyne by HMS Garry, commanded by Charles Lightoller, possibly the last U-boat to be sunk during the Great War. In his postwar memoirs, Fürbringer alleged that, after the sinking, HMS Garry hove to and opened fire with revolvers and machine guns on the unarmed survivors of UB-110. During the ensuing massacre, Fürbringer watched the skull of an 18-year old member of his crew being split open by a lump of coal hurled by a Royal Navy sailor. When Fürbringer attempted to help a wounded officer to swim, he was told, “Let me die in peace. The swine are going to murder us anyhow”. The shooting only ceased when the convoy the destroyer had been escorting and which contained many neutral-flagged ships, arrived on scene. He later recalled: “As if by magic the British now let down some life boats into the water”. Lieutenant Commander Lightoller was awarded a bar to his Distinguished Service Cross for sinking UB-110. A total of 23 members of UB-110’s crew died during the sinking and the alleged ensuing massacre. 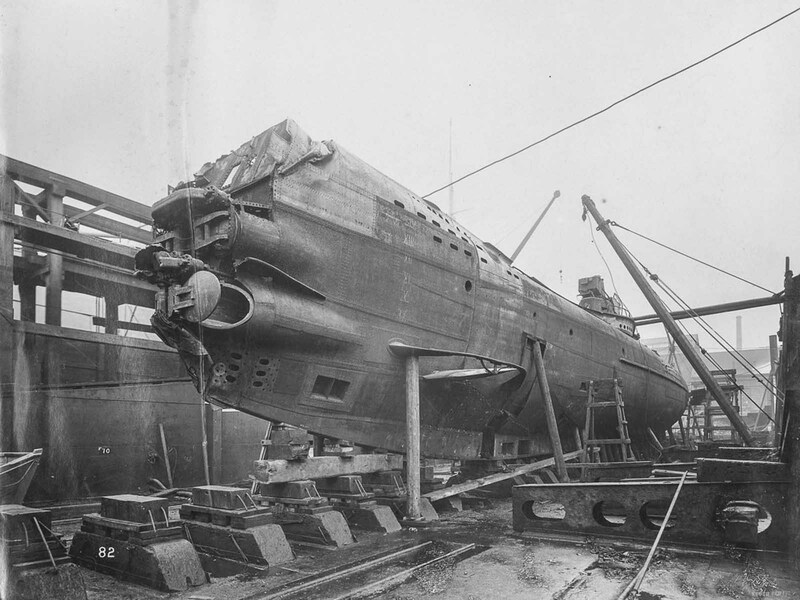 In September UB-110 was salvaged and placed in the admiralty dock, with an order to restore her to fighting state but this time to the British side. 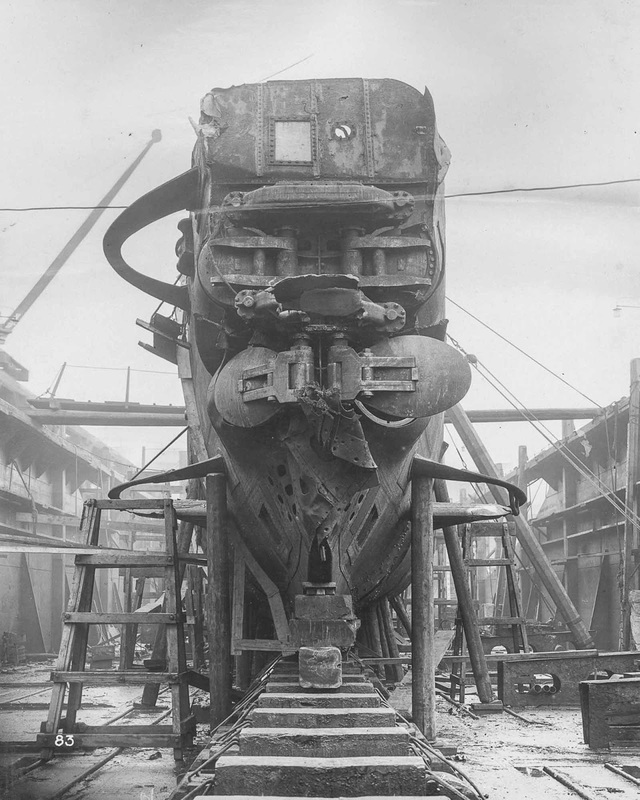 The Armistice, that ended the World War One, caused work on her restoration to be stopped. She was towed on another dock and was subsequently sold as scrap. An unsettling discovery during her salvage was that some of her torpedoes were fitted with magnetic firing pistols – the first such to be identified properly by the British. Luckily, these early examples were proving problematic, often detonating their weapons prematurely if at all. Magnetic pistol is the term for the device on a torpedo or naval mine that detects its target by its magnetic field, and triggers the fuse for detonation. A magnetic pistol on a torpedo allows the torpedo to detonate underneath the ship, instead of upon impact with the side of the ship. The explosion will lift the ship out of the water and may break the back of the ship, splitting it in two. How the sailors identified those valves and wheels? Actually these photos were taken after the submarine was recovered from the bottom of the ocean. The control room was covered with rust and slime. Many of the gears and wheels were color coded, some of them had numbers. Usually the sailors learned pretty well maneuvering on the control room, for them wasn’t difficult at all. Unrestricted submarine warfare in early 1917 was initially very successful, sinking a major part of Britain-bound shipping. Nevertheless, with the introduction of escorted convoys, shipping losses declined and in the end the German strategy failed to destroy sufficient Allied shipping. An armistice became effective on 11 November 1918 and all surviving German submarines were surrendered. During the war Germany had 351 operational boats, sunk in combat: 178 (50%), other losses: 39 (11%), completed after Armistice: 45, surrendered to Allies: 179, men lost in U-boats: 5,000 killed. 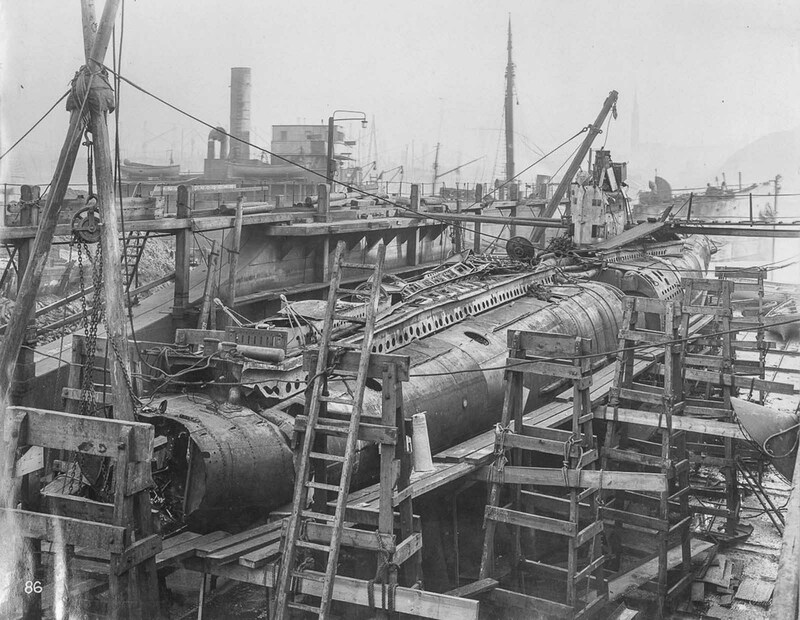 U-Boat 110 in dry dock. 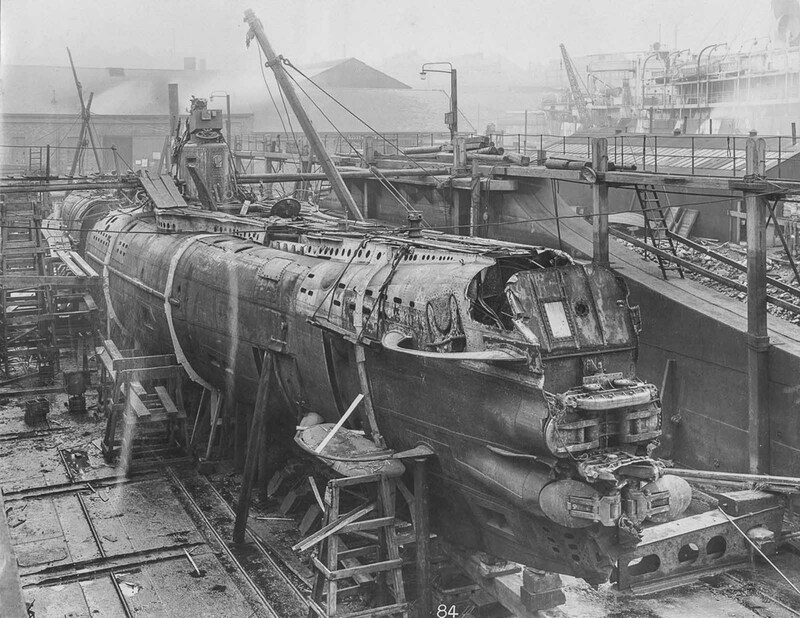 The UB-110 was rammed after attacking a merchant shipping convoy near Hartlepool in July 1918. In September she was salvaged and placed in the admiralty dock. There was an order to restore her to fighting state but this time to the British side. Electric control room, looking aft to port. 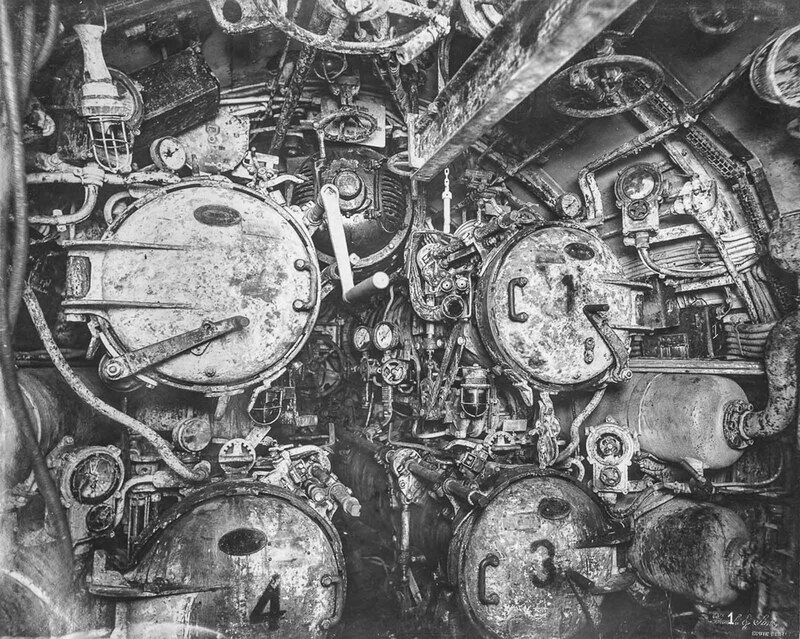 Torpedo room looking aft. The beam for lifting torpedoes into place is overhead. 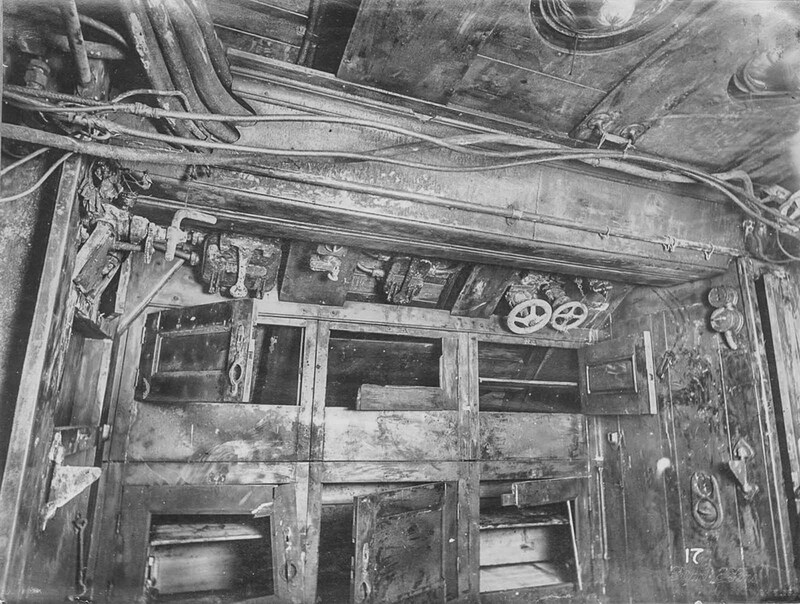 (Left) Number 6 compartment with sleeping berths. (Right) Crew space. 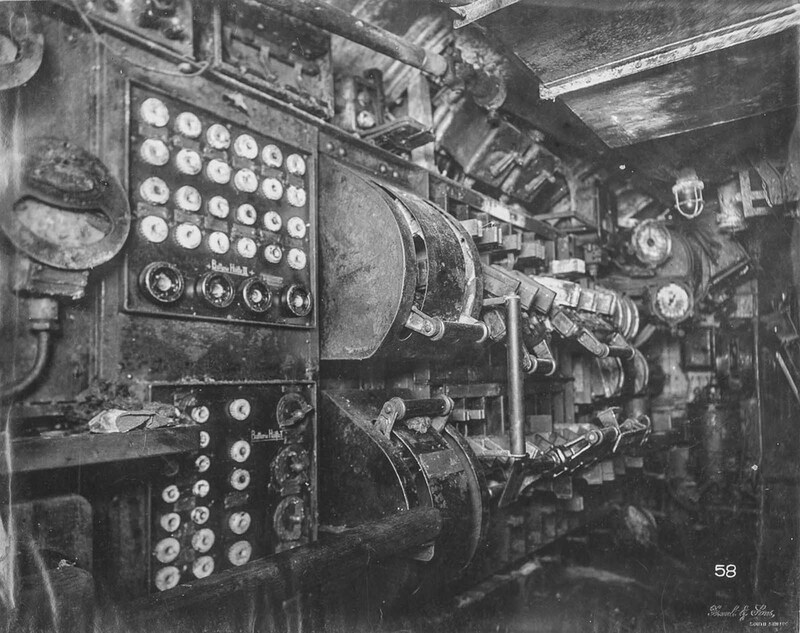 (Left) Electric control room, looking aft to motor room and stern torpedo room. 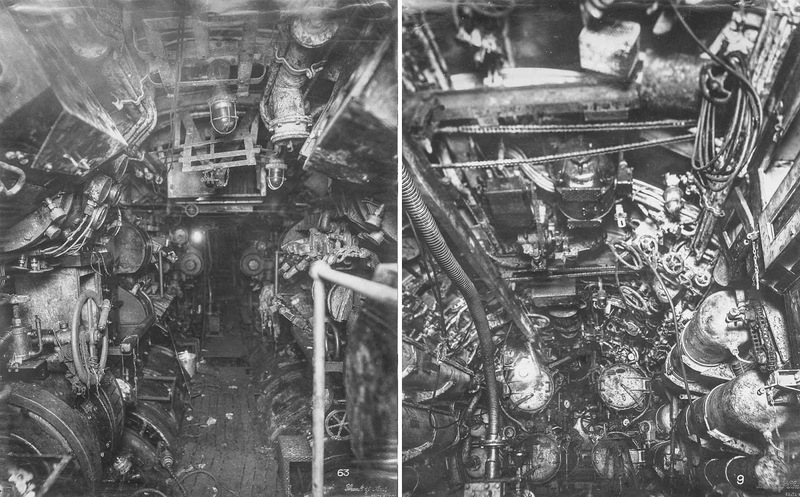 (Right) Engine room, looking forward on starboard side. (Left) Electric control room, looking forward. 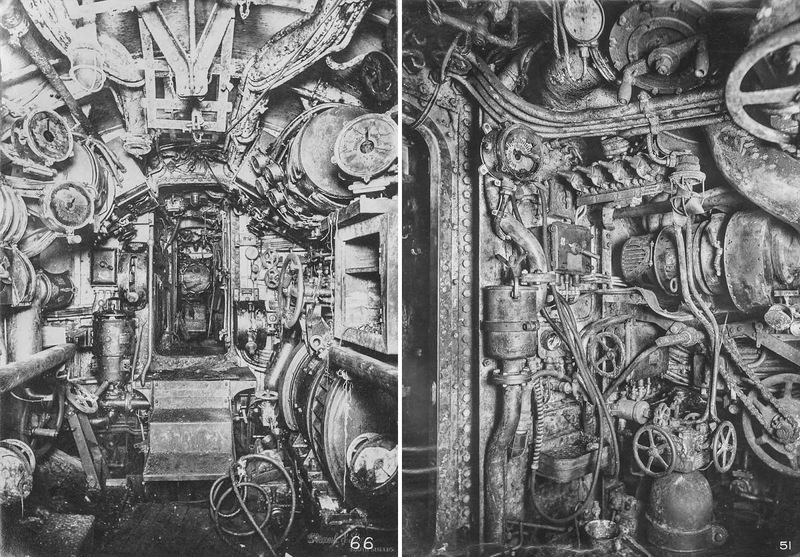 (Right) Forward torpedo room. 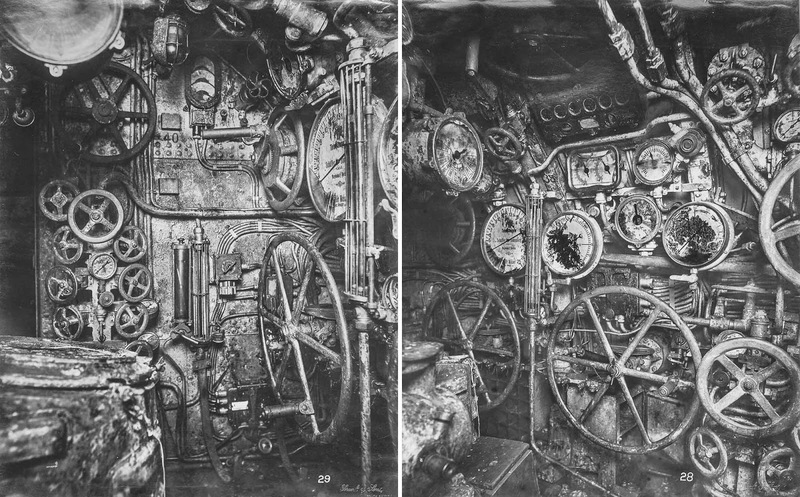 (Left) Aft torpedo room. (Right) Control room looking forward to port. Wheels to control air temperature and pressure are visible. (Left) Control room looking forward. Hydroplane gear, depth and fuel gauges are visible. (Right) Control room looking forward. The depth gauge, engine telegraphs, wheels for flooding and blowing, and hydroplane controls are visible. 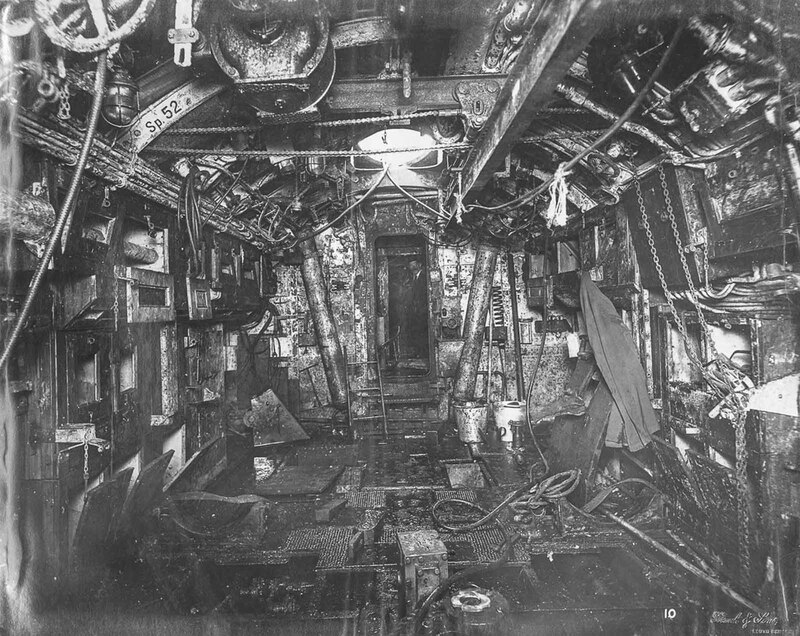 (Left) Control room looking aft, starboard side. The manhole to the periscope well and various valve wheels for flooding and blowing are visible. (Right) Control room looking aft. Wheels for raising and lowering the periscope are visible. The HMS Garry was commanded by Charles Lightoller, the second mate (second officer) on board the RMS Titanic, and the most senior officer to survive the Titanic disaster. The second photo shows the forward torpedo room tube breach doors. Many older submarines had forward and after torpedo rooms. 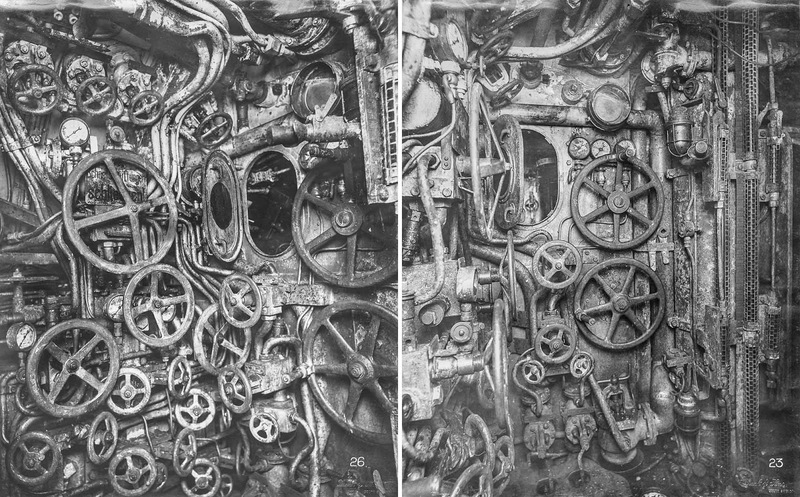 This submarine also had 2 after torpedo tubes. 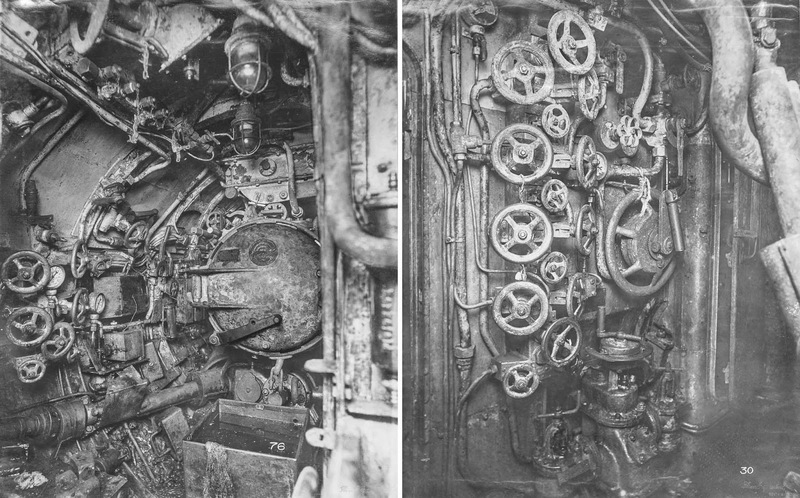 The upper photo could be the control room, but the "conning tower" on many older subs was a small space above the control room where the periscopes were accessed and orders were given to fight the ship.